While biting at the bit at any opportunity to get my cucumbers off to an early start, I thought about how perfect 16 oz. 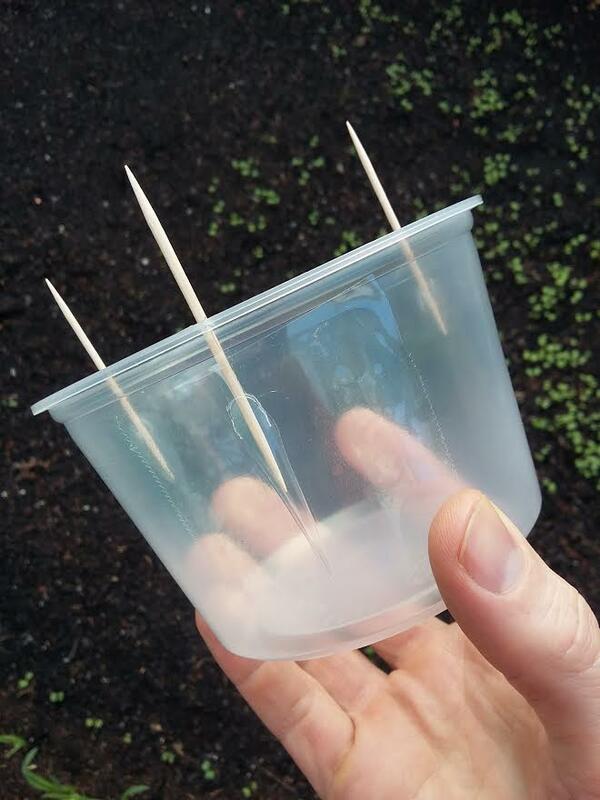 deli cups are for the size of the cucumber plant within the first month of growth. 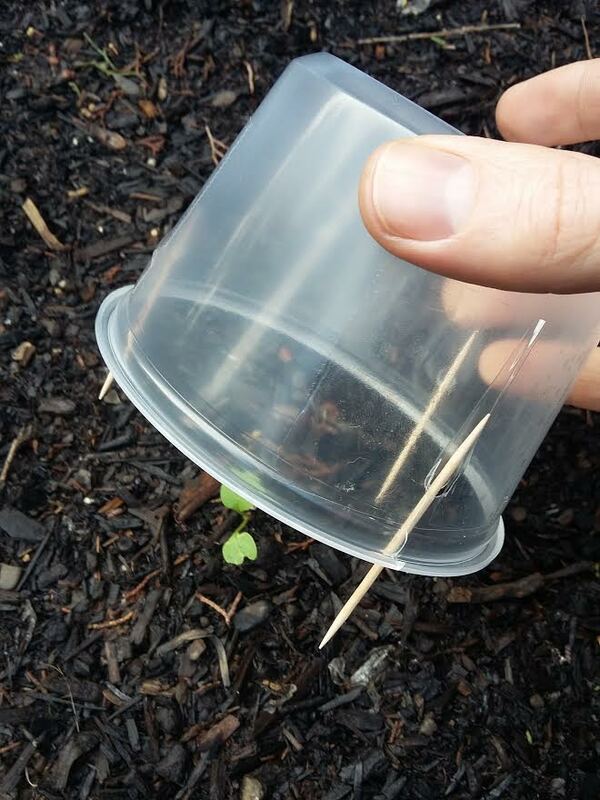 So I decided to make a deli cup cloche with toothpicks as stakes to ensure they do not blow away in the wind. So, the very next chance I had to go shopping for gardening supplies landed me in my local Smart & Final, which happened to have the 32 oz., the 8 oz. and the 6 oz. sizes, but were out of stock of their 16 oz. containers. Or were they? After about 10 minutes of looking on the shelves, I found a box in the above overstock labeled 16 oz. polypropylene deli cups. I took down the box, opened it up and voilà! The three holes with toothpicks in them. At first I thought about drilling holes in the bottom, but that did not seem very stable. Then I remembered that we did still posses one hole puncher that had not disappeared yet. I was going to make two holes per toothpick, but the hole puncher did not have enough clearance, so I just used packaging tape to provide additional support. I think I rely more on packaging tape then duct tape – packaging tape seems like it can be used for nearly anything. The design is simple: A 16 oz deli cup with 3 holes. Insert toothpicks into holes and secure with packaging tape. 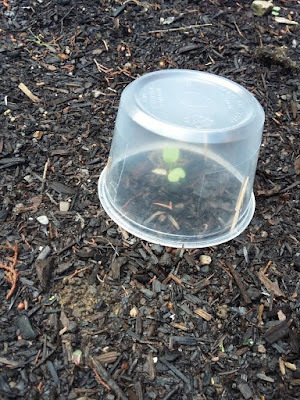 Not only will this work until the germinated seeds emerge from the soil, but when it finally stops raining this season, I can pull the 3-legged deli cup cloche up a little so that ventilation can occur while still providing heat at night. However, if I do this I will still need to put collars around my seedlings as the slugs have been relentless this year. Hey, I sent you a email ? I do my best to answer emails. If you sent one to me, it may take a day or two to get to.